The American Thoracic Society has defined asthma as the increased re­sponsiveness of the trachea (windpipe) and bronchi (the two main subdivisions of the trachea that transport air to and from the lungs) to a variety of stimuli resulting in airway obstruction that is reversible spontaneously or as a result of treatment. Breathing becomes diffi­cult during an asthma attack, and this can be frightening. 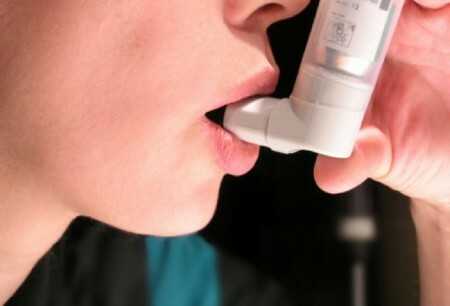 In the United States, 14 million people are asthmatic and more than 5,000 die from asthma-related condi­tions each year. Asthma affects about 5 percent of all Americans. Although asthma has no cure, medications are available to effectively prevent or reduce the length and severity of an attack. Asthmatics often remain sedentary because of their fear of exercise-induced asthma (EIA). But asthma should not deter children, adolescents, and older adults from participating in physical activities. The American Academy of Allergy and Immunology encourages regular exercise for asth­matics, who receive the same health benefits as other individuals. People with asthma have competed success­fully in sports at national and inter­national levels. Asthmatics who want to exercise or who currently are exercising can use the same method of prevention that Olympic athletes practice. 1. Airway-opening drugs should be used immediately prior to exercise or competition. 2. A gradual warm-up period of 15 minutes should be followed by a 15-minute period of rest. This pro­tocol reduces the probability of incurring exercise-induced asthma for about 2 hours. 3. Treatment must be individualized to find the optimal regimen for each individual. This will involve several trial-and-error attempts be­fore determining the best approach. The types and intensity of exercise that contribute to the onset of exercise-induced asthma have been identified. The mechanisms responsible for EIA are the loss of respiratory heat and water because of the high rate of breathing during exercise. The more intense the exercise, the greater is the loss of heat and water. Therefore, the more intense forms of exercise usually are the most asthmogenic (capable of inducing bronchospasms). Swimming and other water activi­ties are the least asthmogenic types of exercise. This is probably attributable primarily to the warm, moist environ­ment in which they are done and, sec­ond, because the high breathing rates necessary to initiate bronchospasms are difficult to achieve. Running and cycling seem to be the most asthmo­genic of the outdoor activities, but the risk can be minimized by following the guidelines for Olympic athletes alluded to earlier.